Looks like there was a broad based rally in equities markets around the world. Treasuries were selling off slightly, with money moving into commodities and stocks. The dollar took a hit, but started to bounce back at the end of the week. Is the risk appetite returning? We’ll need more time to evaluate. 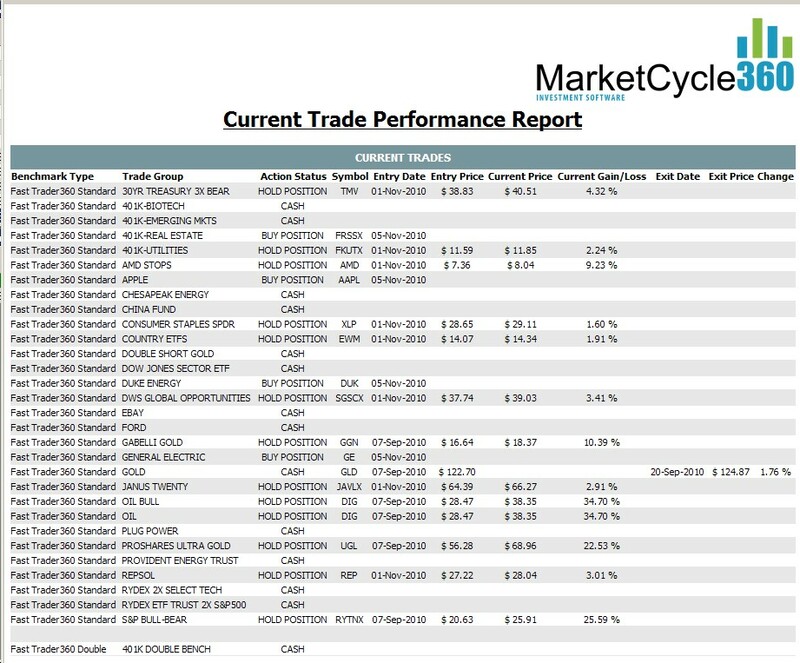 Meanwhile, MC360 gave us a few more signals… Buy Apple (APPL), Buy Real Estate (FRSSX-my 401k), Duke Energy (DUK), and General Electric (GE). Very broad signals. All of last weeks signals are already in profit. So, is there a “next shoe to fall?” I thought it would have been commercial real estate. But, banks have been holding on to foreclosed residential real estate, so they can sell for higher prices in the future. The Fed is being used as a stop-gap for the banks to hold on to all the real estate. Is the dollar going to be the next shoe to fall? Or will interest rates? Probably not interest rates since the Fed will be buying $650 to 850 Billion worth. The dollar seems to be the highest probability. The Fed is very afraid of deflation. The Feds stimulus will be heading into the markets. In the latest update, we have several buy signals. Gold and oil is still a hold. EWM – the country ETF for Malaysia has signaled a buy. I was disappointed that Ford (F) did not signal a buy, because personally I think it is the strongest automotive stock for the long-term. Interestingly, the Inverse 30-year Bond (triple leverage) Bear fund has signaled a buy. What does that mean? Rates may be bottoming. Maybe we have these buy signals ahead of another major bull run. The Republicans may win big this Tuesday, which will be a big positive for small business. The Democrats have shown a willingness to punish business big or small. And, they want to punish the wealthy, who provide us jobs, give to charities, etc. 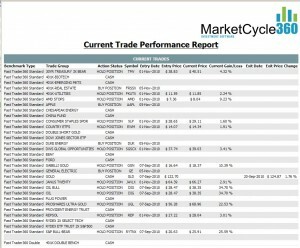 After updating to the new algorithm for MarketCycle360, profits are continuing to mount. The Gold position is on a roll, and the Oil bullish position is paying off. I had sold off some of my Gold position when the gold index lost momentum, but GGN is still hanging tough. MC360 still sees some strength in the S&P500… holding. There is no other sustained movement in any other sectors. 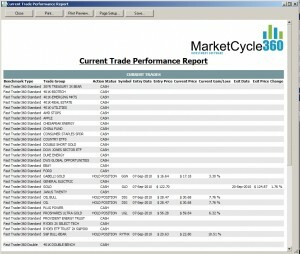 MC360 has not initiated any other trades in any other sectors. 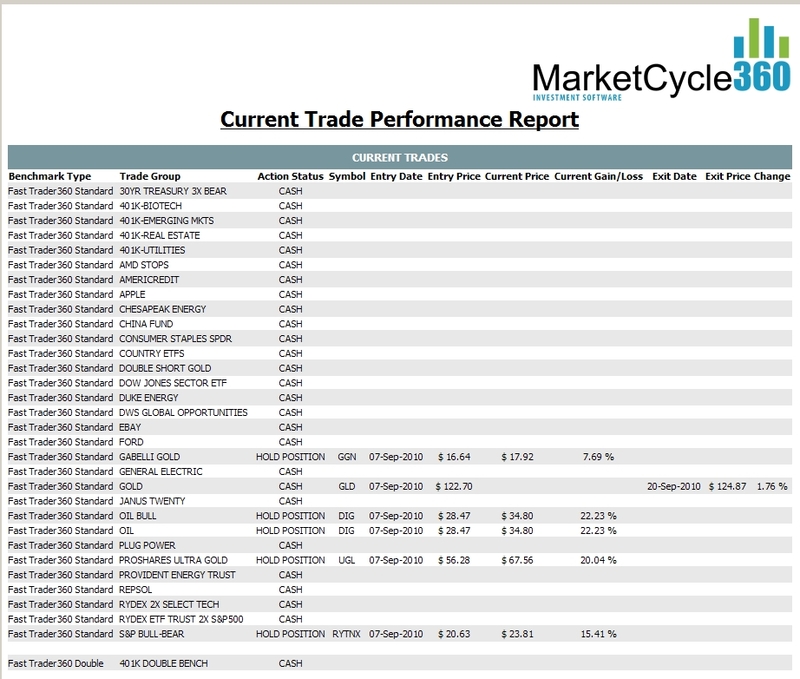 Marketcycle360 has had a major update on the 1st of September, previous results have been erased and the updated algorithm is now in effect. It should get us in and out quicker, capturing profits. 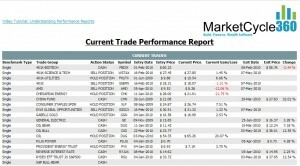 Half of our gold position has been liquidated. The long OIL position is still open. If you believe that the economy will strengthen from here, oil should stay at this level or rise slowly along with the continued stabilization of the economy. 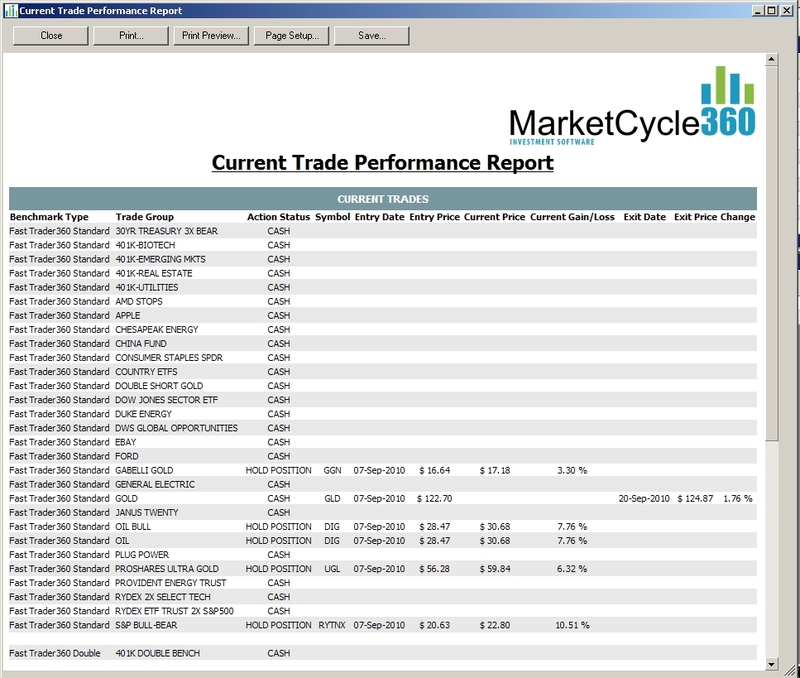 Marketcycle360 signaled closing of my Emerging markets fund in my 401K (SSEMX). The Nasdaq is up over 4% as I write, so I expect these funds to close in the black after the close today. Marketcycle360 also signaled closing of the science and technology fund (WSTAX). It will close in profit. 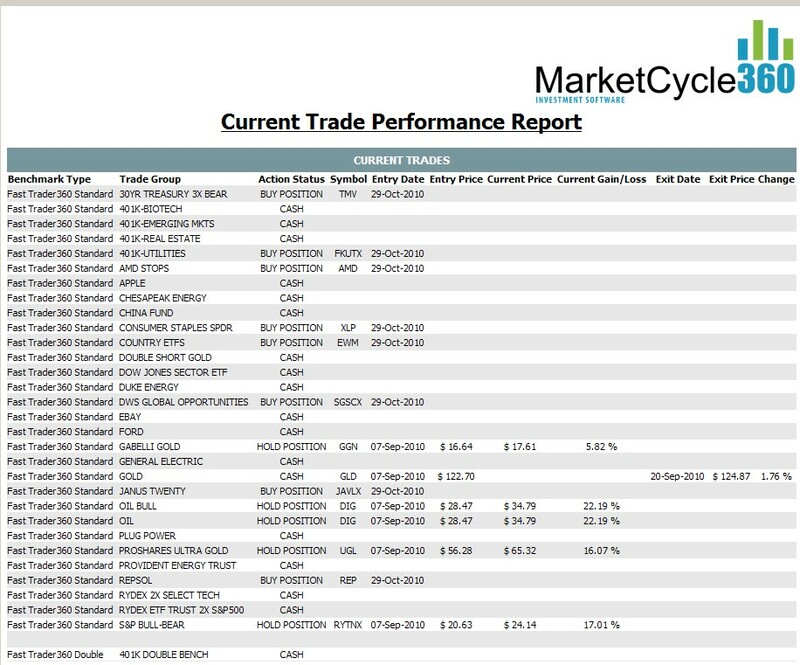 The Utilties fund (FKUTX), in my 401K is still holding with a profit of over 6.5%. MC360 signals that AMD close the current position. Currently, the stock is up over 5.7%, but the position will close at a small loss. AMD is one of the impressive long term timing stocks for MC360. 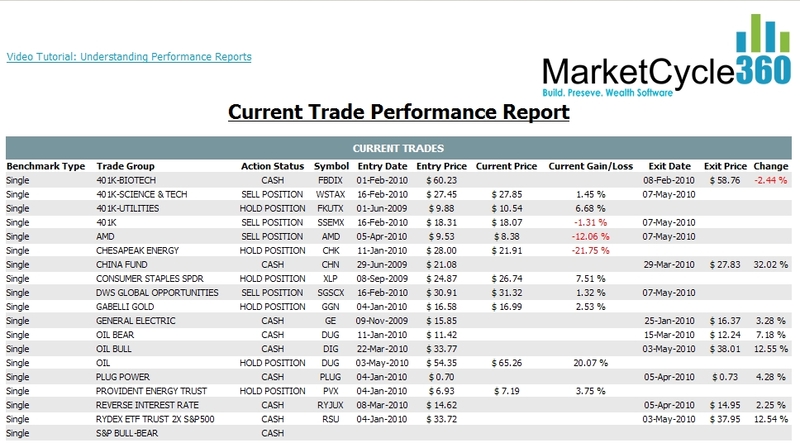 By just following AMD, Marketcycle has impressive average gains of over 50% a year. I will post the historical success of MC360 and AMD at a later time. DWS Global opportunities (SGSCX) has been signaled to exit for today. It should close with a small gain. NOTEABLE: The oil bearish position is up over 20% in one week. I like following these signals, but the market is very volatile at the moment. Volatility ususally leads to a market turn. I am looking for the market to make a historic top soon. So, I would sell this oil position with a tight trailing stop.